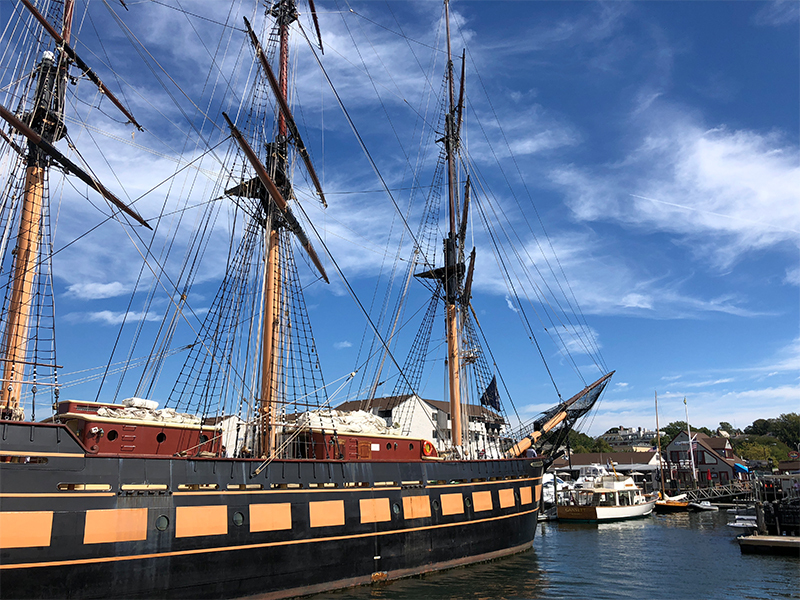 Visitors are invited to tour Rhode Island’s Official Flagship, Oliver Hazard Perry (OHP) during this weekend’s Bowen’s Wharf Seafood Festival one of New England’s most popular coastal festivals! Tours of this 200-foot, three-masted Class A Tall Ship include the main deck, the Great Cabin, wet lab, and classroom spaces will be available both days of the festival, Saturday, October 13th and Sunday, October 14th. Over 30 culinary vendors, 20 year-round boutiques, and six live bands participate in this two-day, rain-or-shine celebration of the Harvest of the Sea. “Glimpse what the working waterfront might have looked like in the 18thcentury, when Newport was the third-largest trading port on the east coast and Bowen’s Wharf was at the center of it all. In those days there would have been dozens of ships her size,” says Bart Dunbar, OHP Board Chairman and president of Bowen’s Wharf Company in a press release for the event. In addition to ship visits, festival attendees can sample creative cocktails at the Captain Morgan and Belvedere Vodka hospitality tent; chat with brewers from Whalers Brewing; purchase fresh seafood specialities and local food, dessert, juices, crepes, condiments, knives, bags, jewelry, scrimshaw and more; and dance to live music at this family-friendly historic waterfront site. Shellfishermen will be shucking fresh RI littlenecks and oysters. “At Bowen’s Wharf we’re offering the public a last chance to explore the OHP at our largest waterfront festival before they put her to bed for the winter,” says Trixie Wadson, Marketing & Communications Director of Bowen’s Wharf in the release. Since 2014, over 1,000 young people’s lives have been changed by OHPRI’s sail training and education-at-sea programs from Canada to Cuba and many points in between. Another 100,000 people have toured the ship in various ports. With 10,000 nautical miles under her keel, Rhode Island Governor Gina M. Raimondo in July signed legislation making Sailing School Vessel (SSV) Oliver Hazard Perry the Official Flagship and Tall Ship Ambassador of Rhode Island. The ship is not a replica but a modern, steel-hulled vessel purpose-built for training and education to the highest modern safety standards. $5 for adults and $1 for children 12 and under. Day-of ticket sales at Bowen’s Wharf Pilot House and at Bowen’s Wharf Marina. FREE Admission. Pay-as-you-go with vendors and tours. Featured in Coastal Living& YankeeMagazine, boston.com, Global Traveler USA. 2018 event sponsors include Moet & Chandon USA, Whalers Brewing, Belvedere Vodka, Captain Morgan Rum, Cloudy Bay Vineyards, Ardbeg Whisky, and the Diageo brand. Bowenswharf.comfor full list of vendors, music line-up, year-round business directory. For more information, visit www.bowenshwarf.com.